The Guam Women’s National Basketball Team have their sights set on the gold as they prepare for the 9th Micronesian Games in Yap. As their departure draws close, the team aims to combine their talents to construct a strong, collective team effort to pave their way to victory. With several returning players, the team possesses both experience and young talent. Along with varied levels of experience, the team also possesses a versatile set of skills that Coach Eddie Pelkey looks to use in his game plan for the competition. “We have a good amount of speed and there’s a lot of skill that with that speed, which is a good combination. I want to focus on transitioning from defense to offense, and let our defense create easy basket opportunities for our offense. We have good size, as well, so I’m not too concerned with teams that have good post players. We got a couple girls who can consistently shoot from beyond the three point line, so this is also one of the best three point shooting teams that I have had. This versatility forces the other teams to space out the court which is what we want. We want to spread out their zone defense or eventually force them to chase us around the court for 40 minutes,” said Coach Pelkey on the team’s well being. With the squad consisting of many new faces, there are a few veterans to the team who understand the caliber and style of play in this particular competition. 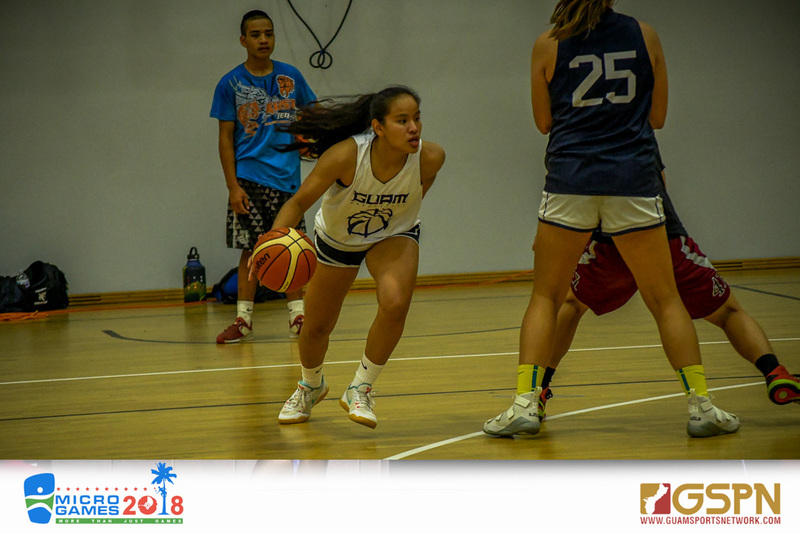 Returning home from playing collegiate basketball for Chaminade University, Kali Benavente understands that her experience in the previous Micro Games forces her to take on the role of a leader in this year’s tournament. Along with Benevente, Destiny Castro is also home from playing for Chaminade University and also has previous experience playing in the Micro Games. Castro looks to keep her team motivated and to keep their eyes set on the Gold. “The expectation is always for us to come out with the gold, but we’re going to take it one game at a time and play every game like it’s our last. They’re going to be very physical out there, so we’re going to be strong and be able to take a lot of impact,” said Castro. There is also a fair amount of players who will be participating in the Micro Games for the first time, but for many of them, this is not their first time playing in an international competition. Rosita Duenas has represented Guam for basketball since she was 13 years old, but this will be the first time she is participating in the Micro Games. Preparation for the Micro Games calls for a different style of play. For Duenas, a quicker pace of gameplay plays a noticeably large role in the delegation’s strategy in the Micro Games. “Micro Games is a lot more fast paced. A lot of our points are going to come off of hustle and from good defense. Personally, I’m looking toward getting faster and developing more speed. Other than that it’s just fine tuning skills and getting accustomed to each other’s playing styles,” stated Duenas. The expectations are high for the Women’s basketball team. With departure date fast approaching, the women’s basketball team is continuing to refine their skills to shoot their shot for gold in this year’s Micro Games.